Feel free to download it ! Per display RGB color correction in VideoMapper and by DMX. Philosophy behind all ArKaos’ control solutions focus on making video surfaces, screens, etc., work just like moving lights. The goal is to empower lighting designers, programmers and operators and help make the integration of video and pixel lightsources seamless with lighting in their visual designs via DMX control and without needing to utilize a separate video controller. This opens up the revolutionary use of the lighting console’s to drive video sources. Whatever the size and scale of the show – from the smallest and most intricate to the largest and most complex – the principal is the same. The person operating the lighting console can have the capacity to run all visual elements together. 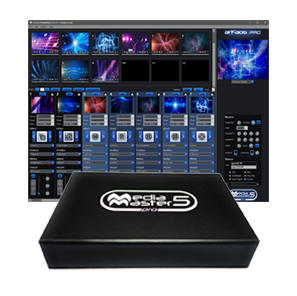 The MediaMaster 5 upgrade is fixture based and introduces fixture personalities for the various video entities to the lighting console – just as if they were moving lights. There will no longer be a need to build special personalities for these video elements giving MediaMaster an even more flexibility as a visual control system. Introducing MediaMaster Pro 5! Features: 36 Layers, MediaHub for network sharing, LEDMapper 3 with unicast, Lyric Player, Art-Net, Kling-Net, DMX, MIDI and time code. Combining maximum functionality with simplicity of operation, the new ArKaos MediaMaster Pro 5.0 retains the user-friendly and broad functionality that has become the trademark of the ArKaos product range. This software uses the NDI™ library. NDI™ is a trademark of NewTek, Inc.